Here's our first family portrait for the year! I mentioned in my resolutions post that my goal is to take one family portrait (with all 4 of us) each month this year. Month 1: check! I love this photo of your family, Katie! So candid and lovely. Aw this is so sweet! You have a lovely family! the lighting is heavenly! and who says everyone needs to be looking into the camera for a perfect family photo? even better that you're not, here :) Can't wait to see next month's! Love it! Your family is so sweet. I love this idea too- I feel like I have hardly any family pictures. I just started The 52 Project with my daughter so at least I will have all of those memories! so so cute! what a great resolution! Beautiful! Such a great resolution! Love this! I love how in the moment and natural it is! It's beautiful and so happy. And I am so envious of all your natural light! I liked the page in facebook. Aw this is such a great challenge, it'll be fun to look back and see how much the girls have grown. Also - Mouse Trap?! Amazing! yay! it's beautiful. i love it. 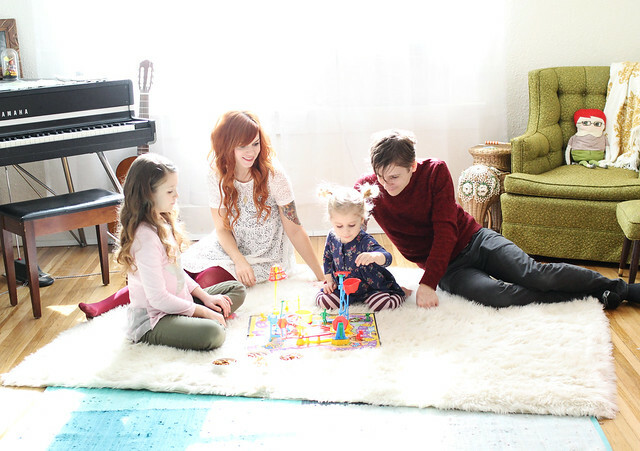 most beautiful family, ever. what a great idea! When I went through our Christmas photos I realized I was not in a single frame- the down side of being the photographer of the family. So I'm making it a point to be in front of the camera more often this year! i love that! and what a good resolution. it can be tough to do! but it'll be worth it at the end of the year…even if you have to work extra hard to get one or two of 'em in 2014. you are all so sweet! What an awesome family portrait!!! There is nothing like candid real life photos. I know for sure that those are the best ones we have of our family growing up! Aww, nice goal und a really nice picture!